As you can see, by trawling through this, I have gone back and forth between KDE and Gnome a lot. As I’ve mentioned many times before, I initially loved KDE over Gnome. 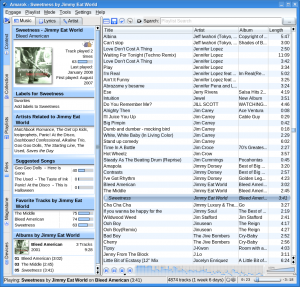 It looked more like Windows, it had more neat options, and great programs. Not only is Amarok the best media player out there (although Rhythmbox is not far behind), but the KDE programs feel so much more tightly integrated than Gnome. That’s one part where they’ve always had a huge lead over Gnome, although Gnome has been catching up recently. Still, I hope that KDE continues to evolve its KParts and KIOSlaves infrastructures. (Or whatever they evolve into in KDE4) KDE programs also just seemed to fit together visually so much better, I don’t know why because Gnome has the HIG. But I left KDE for Gnome for a few reasons. First of all, as Gnome has been getting leaner and leaner on system resources, the KDE 3 series remained bloated as a blue whale sloshing around in my RAM as though it was just a kiddie pool and not the ocean. Also, I have had KDE programs crash on me orders of magnitude more often than Gnome programs. Finally, KDE has always been treated as a second-class citizen within Red Hat. That’s why Mandrake was original started! It was originally just a KDE version of Red Hat before branching off and losing RPM compatibility. But now I want to look at KDE again because a few things have come together to change some of the reasons why I left KDE. First of all, with KDE 4 by basing the desktop on QT4 plus other refinements it’s supposed to be light as a feather on RAM. Sure, it still won’t equate to Fluxbox, but I have a modern system, I just don’t want it to swallow up my RAM like that Kobiyashi at the Nathan’s Hot Dog eating contest. Also, ever since Fedora 7, The Fedora Project has had the KDE Special Interest Group to make sure that KDE is treated well within Fedora. It finally has integration with the updatesd program, responsible for notifying me when there are updates to download. It was really a pain to see that in Gnome and not in KDE. 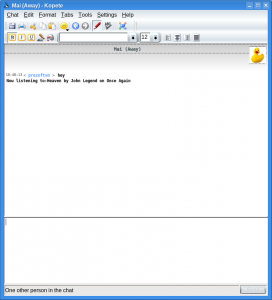 I also wanted to look at KDE 3 now to document what it looked like and how it worked for me so that I can compare this to my experience with KDE 4. So, I logged into KDE from a fresh startup in Mario. It loaded up a little bit slower than Gnome, but not by too much. And, it’s not fair to look at that because KDE saves the state of your desktop when you logout so I have it automatically loading SuperKaramba, Kopete, KGPG, Kerry Beagle, KGet, and Tomboy. Recently I’ve switched to accessing my Gmail via IMAP vs POP3. This allows me to login via KDE or Gnome and have access to the same emails in my inbox. So, since I always have Evolution and Rhythmbox open in Gnome, I opened up Kmail and Amarok. Before I continue, let me say that the developers of Konqueror have some work to do. Apparently they don’t support AJAX very well because I am not able to use any of the advanced features of my blog nor does Gmail work with full functionality. So who cares if it passes the Acid2 test if it doesn’t work on the sites that I need it to. The info on how many times you’ve played the song and the last time you’ve played it is nothing special, but beneath lies the power of Amarok. 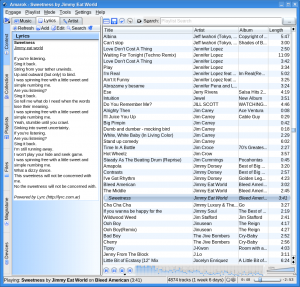 You can add labels to each of your songs and then use that to create dynamic play lists. Amarok then consults last.fm to figure out which artists are similar to the one you’re listening to. So you can use this to acquire music by other artists that may be similar to the one you’re listening to. 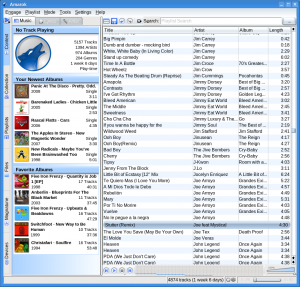 Then, it also lists all the music in your current music library that are by similar artists. And it also shows the rating each song has. After all, you may have songs by similar artists which you don’t like. This is a good point to mention that I really like Amarok’s rating system. Unlike others which are on a 5 star scale, Amarok is a 0-100 scale so it gives a lot more room to tell how much you like the song. Also, their auto-rating system works better than any other I’ve ever used. Anyway, under that is a list of your favorite songs by the same artist. 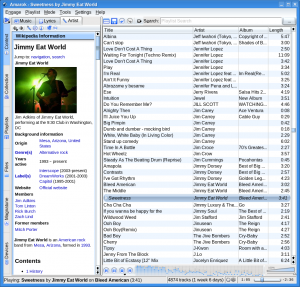 So if you can easily jump to any of those songs by double-clicking. Then it shows each of your albums by the same artist and if you click those you can see the songs on those albums. Tell me you’ve seen another media application that makes such a good use of the metadata it has on your music! But it doesn’t stop there. If the song you’re listening to is reasonably popular, clicking on the lyrics tab will bring up the lyrics to the song. You can learn them or just use it to sing along to one you don’t know as well. And there’s one more bit of nice integration thanks to the use of KParts, Amarok can integrate Konqueror into it and you can see the Wikipedia page for the artist you’re listening to. And sometimes I start up a media player and I’m not sure where to go; what I want to listen to. Here Amarok is also helpful. What I like here is that it lists your newest five albums. For Rhythmbox I had to create a dynamic playlist to hold my newest albums. 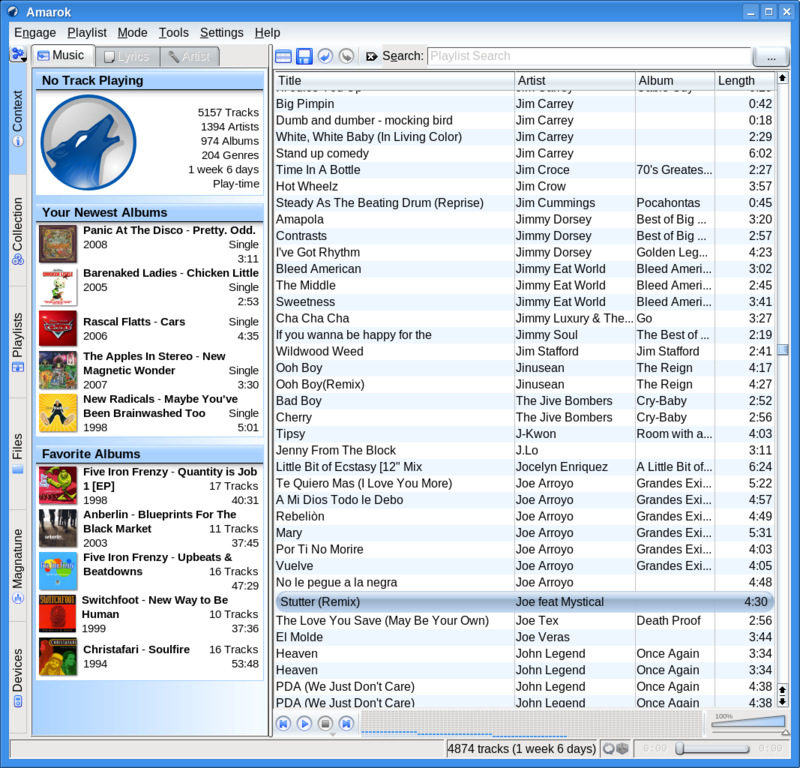 It also lists your favorite albums. So if you want to quickly jump to listen to some music you know you’ll love, you can just double click on those and get the songs. Or you can drag the album over to the right into the playlist. My favorite is the Now Listening plugin. Pidgin has a similar one, but it doesn’t seem to actually ever work. The other really great thing about Kopete is how you can customize it to suit your style. 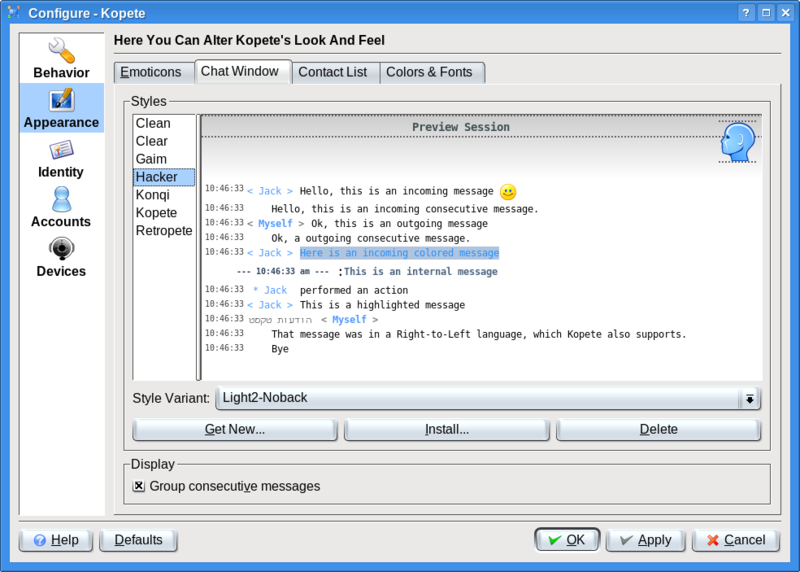 Unlike Pidgin which is mostly an AIM clone, Kopete lets you pick everything from your Smiley Style to Chat Window style. So far KDE hasn’t been too unstable. I’m glad I finally fixed the problem where Compiz kept starting in KDE as it was having a huge detrimental affect. So far I could potentially go back to KDE. More in a future post. How Long *were* They in the Garden? Konqueror has a fine rendering engine, but it, (and Safari), is a bit sparse in support of the DOM. AJAX and its front-end, DHTML, rely on accessing properties of the DOM and sites that are dependent on these technologies will often have problems on Konqueror or Safari. It is debatable whether the fault lies with the browser developers or the web site coders. For an end user, however, Firefox or Opera offer excellent performance without some of the Web 2.0 frustrations. Well, as long as the web site developers are standards compliant, I think the blame lies squarely at the feet of the Konqueror coders. People expect to be able to visit these important sites. I mean, for a Linux browser not to work correctly in Gmail is a travesty. Hopefully they’ve fixed this in KDE 4.0. But yes, you bring up an excellent point here. People always ask, “Why another browser? Why another media player?” Because if the one that comes with your Window Environment doesn’t work for you, it’s important to have alternatives. What was your source for the fact that gmail is standards compliant? And which standards? With a quick check I noticed there were some odd things at least in it’s HTML. Also what I’ve gathered about web development is that sites are developed for a certain set of browsers and once they work in them the development focuses on other matters. gmail could probably work with Konqueror but I think G doesn’t care that much about K.
And I think it’s very rare that a web site is standards compliant since some cross-browser functionality might even require bending the standards. It also is very painful to make cross-browser functionality, not to mention trying to also keep it standard. That said, I don’t know exactly how compliant Konqueror is. @Heikki – First of all, good point on Gmail – perhaps it isn’t standards compliant. But I guess those are two points that I failed to sufficiently separate. Point 1 – they need to do whatever it takes to make Gmail work because Gmail is like Youtube, Flickr, MySpace, and Facebook (at least in the USA) these are sites that LOTS of people go to and expect them to work. So it doesn’t matter how free Linux is if the sites don’t work. I mean we already have problems with flash sites (and I know that’s Adobe’s fault, not ours since flash isn’t FOSS). So we need to make sure these sites work. But Point 2 is that any standards compliant site SHOULD work the same in all browsers. One neat thing about this post for me. This post was the fastest to gain views ever. In just one day it got 394 views. Sure, some sites get thousands per day, but for a little site at the edges of the blog universe, that’s a lot in just one day! Thanks to everyone who’s been sharing the link. How can i stop compiz from loading in KDE automatically? You need to change the window manager in KDE to KWin. That happened to me as well at one point. Is there a way to make it happen automatically so that everytime I use KDE compiz uses KWin but in Gnome it uses compiz? Also I have to enable desktop effects everytime I log into KDE.Is there a permanent solution?